A bust of Jose P. Laurel located in Plaza Laurel, Barangay Kumintang Ibaba, Batangas City, Philippines. By that time he had already risen from a clerkship to the position of Chief of the Executive Bureau (1918). Governor-General Wood appointed him Under-Secretary of the Interior in 1922 and Secretary in 1923. In a Quezonian political maneuver, Laurel's resignation that same year in protest against alleged interference by the Governor-General in a police matter (the Conley case), precipitated the so-called "Cabinet crisis". Thus launched into politics, Laurel ran for the Senate and was elected Senator from the fifth senatorial district in 1925, serving until 1931 in which year he was defeated for reelection by Claro M. Recto. In 1934 he was elected a delegate to the Constitutional Convention, in which he played a leading part. In 1935, Commonwealth President Quezon appointed him Associate Justice of the Supreme Court. The following year, his scholarly "The Three Powers of Government under the Philippine Constitution" was published. He had already written "Local Government in the Philippine Islands" (1926) and "The Election Law" (1931). He had also written a series of able articles for the Philippine Law Journal, "Lessons to be Derived by the Philippine Islands from the Legal History of Louisiana". The foregoing outlines his career up to the time of the War in the Pacific. He was generally considered an able man, and strongly nationalistic. He was also known to be not so much "anti-American" as "pro-Asian" in his views. He held an honorary doctor's degree from the Imperial University of Tokyo and one of his sons had been a cadet in the Japanese Military Academy. In 1942 he was one of the six Filipino leaders named to the Philippine Executive Commission by the Japanese High Command, being named Commissioner of Justice. Jorge B. Vargas was Chairman. It was through this Commission that the Japanese ruled the country for the first two years of their occupation of the country. On June 5, 1943, Laurel, who had been newly named Chairman of a "Pacification Body",, which was to take charge of a drive aimed at curbing guerrilla activity, was shot from ambush while playing golf at the Wack-Wack Club; struck by three bullets, he was severely wounded. By that time the Japanese reverses in the "southern regions" were so serious that the Japanese Government decided on granting the Philippines a mock independence. The necessary steps were taken in a great hurry. Laurel was named President of the "Preparatory Commission for Independence" which framed the new "Constitution", following which the "National Assembly" elected Laurel "President" of the "Republic" which was inaugurated on October 14, 1943. The attempted guerrilla assassination of Laurel had tended to convince the Japanese, who did not trust Vargas, that Laurel was "their man". "for wealth, glory, or glamour, forthere are no such things in the government in these crucial days. We are simply following in the footsteps of our heroes and martyrs. If we can not say that we have died for our country, at least we have endeavored to serve her with all our hearts and souls." Certainly, these were not the words of an exultant quisling. It is now well-known that Laurel saved many valuable lives, including that of Manuel A. Roxas, later to become President; that it was largely because of the stand he took that the puppet government did not, as the Japanese demanded, "declare war" upon the United States and Britain after the first American bombing of Manila in September, 1944, but declared only that a "state of war" existed; and that a threatened conscription of the young men of the country into the Japanese forces never materialized. The Japanese had, indeed, so little confidence in the people and their leaders that they began systematically to disarm even the Philippine Constabulary shortly after the proclamation of a state of war. 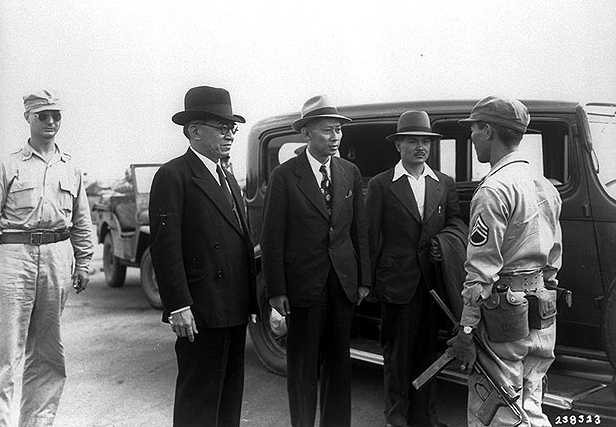 Laurel (left) being taken into U.S. custody at Osaka Airport in 1945, along with Benigno Aquino, Sr. (center) and Jose Laurel III. Laurel and his Cabinet were taken to Baguio by the Japanese in December, 1944, and in March, 1945, Laurel was informed of the "desire" of the Supreme War Council in Tokyo that the President and Cabinet leave immediately for Japan "in order to avoid capture". Most of the members of the Cabinet were unwilling to go to Japan, but Laurel had no choice and with a number of friends, after a long and devious journey, arrived in Japan on June 27. He and Vargas and a number of other prominent Filipinos were arrested there in September by the Americans and were imprisoned in the Sugamo Prison for nearly a year. They were brought to Manila on July 23, 1946, several weeks after the inauguration of the Republic of the Philippines, and lodged in Muntinlupa. Most of the other prominent collaborators were either among the 2,000 political prisoners also held there or among the 1,800 held in the Iwahig Prison Colony in Palawan. The so-called "collaboration" in the Philippines was not understood in the United States, as it was also not understood even by some of the Filipinos themselves. However, none of the men charged with collaboration were tried by American authorities, all being turned over to the Philippine Republic for trial. There were some convictions, and more dismissals and acquittals, and on January 28, 1948, while the trials of Laurel, Recto, and others of prominence were still pending, President Roxas issued his long-awaited Amnesty Proclamation, ordering the dismissal of all cases except those involving persons accused of treason. "for having taken up arms against the allied nations or the members of the resistance movement, for having voluntarily acted as spies or informers of the enemy, or for having committed murder, arson, coercion, robbery, physical injuries, or any other crime against person or property, for the purpose of aiding and abetting the enemy in the war against the allied nations or in the suppression of the resistance movement in the Philippines." In 1949 Laurel ran against President Quirino for the presidency in part because he was burning to "vindicate" himself. He lost, although he ran up a very creditable vote: 1,300,000 (in round numbers) against Quirino's 1,800,000 and Avelino's 420,000. In 1951 he was again elected Senator, this time not by the voters of his old senatorial district, but by the country at large, receiving more votes than any of the other senatorial candidates, almost 2,500,000. In 1953 he yielded the Nacionalista Party nomination for the Presidency to Ramon Magsaysay. In 1954 he headed the Philippine delegation which negotiated the revision of the United States- Philippine Trade Agreement, known as the Laurel-Langley Agreement. There was some question about President Magsaysay's choice of Laurel to head the Philippine delegation as it was feared that he might not be well received in the United States, but Magsaysay believed that Laurel's good showing in the 1949 presidential election and his election to the Senate in 1951, as well as the general respect in which he was held, demonstrated the peoples' faith in him, and he believed also that as his emissary, the Americans would not look upon Laurel as persona non grafa. This proved to be the case, and Laurel, on his return to the Philippines, expressed his great satisfaction with the goodwill he had met with in America. Upon the expiration of his term in the Senate, in 1957, Laurel retired from active politics to head the Lyceum of the Philippines, of which he was the founder. He also helped organize the Philippine Banking Corporation of which he became the first President. Laurel found time in his busy life to read widely and he also wrote extensively. Among his writings are "Bread and Freedom" (1953) and "Educational Orientation for Filipinos" (1955), both of which contain striking passages attesting to the general soundness of his thought and the strength of his faith in God and man. Those who were pro-Japan or pro-Asian or pan-Asian to begin with, which generally involved some degree of anti-Americanism. This group was small and probably none of its members remained pro-Japanese very long after their occupation of the country. Those who were unhappily convinced that the Japanese position in East Asia was invulnerable and that therefore they had to accept the inevitable. This group was not large, but included some of the old government leaders, including a number of convinced propagandists. Those who were convinced that though America would ultimately defeat Japan, this would take a long time during which they had to make the best of the situation. This group included most of the old government leaders who, because of their prominence, were especially on "the spot" and who in many cases at least could not have refused to "cooperate" with the enemy without paying the price paid by such men as Chief Justice Jose Abad Santos,-death. Many of them acted from fear, either for themselves or for their families, a fear which the Japanese knew well how to inspire and maintain. Almost all of these men no doubt convinced themselves that simulated "cooperation" was best not only for themselves, but for the country ana the people, reasoning that if they did not work with the Japanese to some extent, the enemy would turn to worse men for their instruments. This, indeed, was true enough. Those who were petty careerists and who, offered "place" and limited authority, grasped the opportunity for what they considered self-aggrandizement. This group included some of the less successful government officials and some of the younger men who followed the example they imagined was being set by the more responsible leaders. The opportunists who saw in collaboration with the enemy a chance to gain wealth for themselves. These men were the most despicable and were found in the ranks of the other groups also. Most of them, however, were in the "buy and sell" business, dealers in supplies for the Japanese military. Some individuals among them were members of the more prominent families who, as such, were "on the spot", too, like the leading officials. While the collaborators therefore included the majority of the old government leaders and perhaps several thousand adventurers, the people as a whole adopted an attitude of passive resistance or of open opposition, and probably as many as 2,000,000 took part at one time or another in guerrilla activities, while millions more supported them. What the Japanese military thought of the Philippine collaboration was perhaps best demonstrated by the horrible massacres in Manila during the Liberation; outside of Manila, the worst outrages were perpetrated in Batangas, Laurel's home province, where from 30,000 to 40,000 men, women, and children were reported slaughtered, including 12,000 in Lipa, 2,000 in Taal, and 1,000 in Tanauan. Laurel was titularly the head collaborator, but it may well be said,-as not everyone understood at the time, even among his own people, that it was good for the Philippines, the United States, and the Allied cause generally, that he was that one. The title could have gone to a man less wily, less brave, less responsible, less of a true patriot. He paid for the sorry eminence in which he was placed in blood and in the agony of disgrace, the latter, in the grace of history, temporary. "Whereas, the death today of Dr. Jose P. Laurel, a great patriot, eminent jurist, statesman, legislator, and constitutionalist, is a great loss to our people and has caused deep sorrow among them, "Now, therefore, I, Carlos P. Garcia, President of the Philippines, do hereby proclaim a period from today to the day of his burial as a period of national mourning. During this period, flags of all government buildings and installations throughout the Philippines shall be flown at half-mast ..."
Laurel was buried at Tanauan on Sunday, November 8, with the simplest of ceremonies. According to his own wishes, expressed before his death, there were no eulogies.